If you haven’t visited anywhere in the East, or have a disposition prone to anxiety, like me then you’ll be completely overwhelmed when you arrive at Bali airport. Oh, and you’ll also be mugged off by local taxi drivers like we were. But don’t be put off by it, just keep calm. We had booked an Airbnb called Villa Jawali in Canggu which was beyond dreamy! With our own pool, a hammock to lounge in, a swing in the kitchen, daybed to relax on and glorious outdoor shower. Plus, it only cost us about £10 a night each. After a long day travelling and zero dinner, we woke up ravenous! We’d already spied those ~boujee~ floating brunches on Instagram and brunch is the best start to a holiday. We headed along to Cabina in North Kuta after finding a local taxi driver. I won’t lie, I expected the floating brunch to be an Instagram gimmick. However, I was certainly wrong. The food was amazing and great value, whilst being the perfect Instagram shot! For roughly £10, you could get a fresh juice, coffee or tea, butter croissant, main dish, sweet dish and free towel for the pool. I choose ‘Classic Avo on Toast With Egg’ and a ‘Babe Bowl’ which were both divine. We ventured to Ubud on our second day. The first stop was The Sacred Monkey Forest Sanctuary. I was so excited. An entrance ticket cost under £5! The monkeys in the forest (more like a jungle) roam freely and it was like nothing I’ve ever experienced. My highlight was when a monkey jumped Ellie in the hopes of finding a snack but it didn’t seem to enjoy Superdrug’s finest strawberry antibacterial! Next up, we stopped to try some kopi luwak coffee over a stunning rice terrace. Essentially, luwak coffe is made from beans pooped out by little creatures called a luwak. (Fun fact: It’s also one of the most expensive types of coffee in the world.) I’m not a coffee expert, it tasted just like normal coffee to me but the cinnamon and pandanus (which tasted liked popcorn gel pens smell) teas we tried were so tasty. After, we went next door to do an ‘extreme swing’ over the rice terrace and take some cute photos in giant nests. Our day didn’t go according to plan because we’d hoped to finish at Lempuyang for sunset but realised that it was actually shut before we even got there! The drive to Lempuyang meant we saw stunning parts of Bali that we wouldn’t have usually, so silver lining. We headed along to Deus Café for their ‘Tacos and Tattuesday’ and it happened to be happy hour when we arrived! The cocktails were delish, the staff were super friendly and the food was spectacular. The breaded mozzarella sticks were gloriously cheesy (Ellie said they were ‘too’ rich, which isn’t possible) and their tacos were the best I’ve eaten. 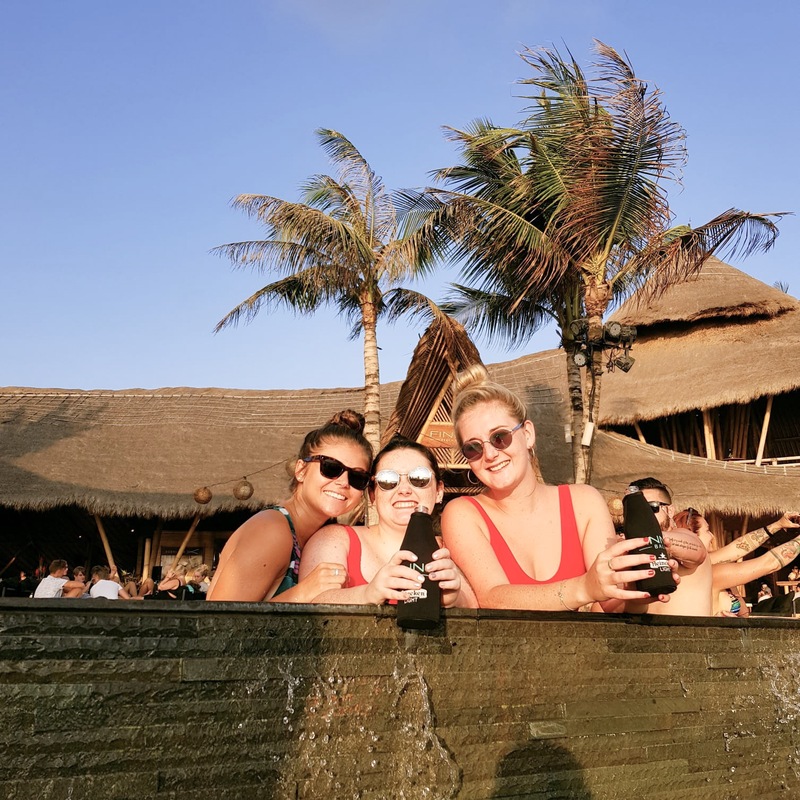 Finns Beach Club is an iconic spot in Bali, so we had to check it out. We drank a couple of buckets of Smirnoff Ice, had a dip in the infinity pool overlooking the sea and ate a feast of delicious food. Finns was the perfect place to unwind, catch the stunning sunset and listen to some old-school tunes. Even if you’re not a party animal, like me, I would still suggest going to Finns in the afternoon or evening because of its bohemian, laidback vibe and views for the sunset. During a trip to the beach, we had spotted a gigantic statue on the opposite side of the island and were immediately intrigued. After some researching, we discovered it was part of the Garauda Wisnu Kencana Cultural Park. The park is full of astonishing statues of Vishnu and Garuda which reach up to 120 meters! Uluwatu Temple was the next stop. Nestled onto the clifftops at the edge of Bali, the views from the temple were unreal, especially during golden hour. The highlight was the traditional Kecak performance at sunset. It was the perfect setting with the sun setting over the cliffs whilst watching the performance – which was so entertaining and special to see. Afterwards, we took our driver’s recommendation to have dinner at Ganesha Café on Jimbaran Beach where we sat on the beach, listened to the waves crashing and ate some of the best seafood I have ever eaten. The final day arrived and Cabina was calling us again. After stuffing ourselves with our brunch, we lazed around the pool at Cabina for the rest of the day. Obviously, a couple of hours doing nothing works up an appetite. I couldn’t choose between ‘Mac & Cheese’ and the ‘Cheese Bang’ burger. Ellie came to my rescue by offering to share both with me (what an angel!). The mac and cheese was heavenly – I’m talking four cheese, crunchy topping and mini garlic croutons on top. Our last evening couldn’t be spent sitting at home feeling sad. We went for an stroll around Canggu and stumbled upon the cutest, Polynesian-inspired restaurant called Moana where I had one of the most divine prawn curries. So there it is. My week in Bali summed up in one very longwinded blog post. Well done to you if you made it all the way to the end! If you ever have the opportunity to visit Bali, seize it. The only regret I had about the whole trip was that we didn’t have time to explore more of the beautiful paradise of an island.